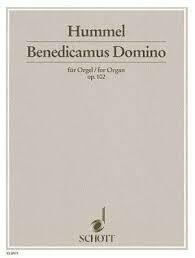 The Gregorian melody of the "Benedicamus Domino" is the starting material for my organ composition op. 102, written in August and September, 1997 for the International Organ Week Nuremberg - Musica Sacra 1998 as a commission from the Siemens Culture Foundation. Over a pedal cluster, extracted from the beginning of the "Benedicamus", a theme is heard in the manual, combining the chant melody with its tritone transposition, complemented by commentaries which can all be traced back to the basic material. This first introductory complex is repeated in a sequence with slight changes. A fast section follows, in which the four versions of a tone-row are situated in the pedal, in each case extended with toccata-like ornamentation. A first exposition of the chant theme follows, set amongst fully chromatic accompanying parts; the Allegro then returns and is leads to a first dynamic climax. Here the Gregorian theme appears in contrary motion over an ostinato pedal figure in 2 waves. A three-section tranquil passage of Arioso character brings the theme and its extended version in tritone transposition. The Toccata-Allegro is taken up again and leads to a further dynamic climax. A brief look back to the Arioso interrupts the urgent forward motion of the metamorphoses. A third dynamic peak is reached and falls away rapidly. At the "sectio aurea" of the work, a Passacaglia begins over a series of 12 notes and leads to the apotheosis of the whole work. After the attainment of the maximum loudness available, a dynamic reduction to extreme pp follows. For the last time, the Gregorian theme, slightly hesitant, is heard. The piece ceases with the characteristic runs of the Allegro section. The work exploits the resources of a large organ in terms of tone and technical possibilities. The interpretation should give the impression of a large-scale Fantasy with metamorphoses. A Gregorian Benedicamus Domino serves as starting point for Bertold Hummel's organ work op. 102. Right at the beginning, the organ presents the basic material of the piece: the incipit of the chant (consisting of whole-tone steps) contrasts with intervallic material (the tritone, formed from three whole-tone steps), whole-tone scales mediate between the two constituents. A new element is introduced in the solo use of the pedals, whose motif material can be traced back to semitone steps. This is finally the trigger for the entry of the complete chant, in parallel second-inversion chords and in the first instance with a quiet flute stop. The array of formal elements is thereby completed: the tritone/whole-tone scale, semitone links, parallel chord sequences are now developed towards a climax before the chant sounds out in fortissimo. A song-like middle section is interrupted from time to time by toccata-like insertions enriched with repetitive groups and is finally forced from the field. A final mounting passage reaches an apotheosis in a song of praise which then yields to the last appearance of the chant as a concluding section with quiet stops (with accompaniment of the vox caelestis). Repetitive segments on the small scale and repeats of formal sections on the large scale structure the work; the technique of accompanying chant with chords in parallel motion is to be understood as a reminiscence of medieval organum (and similar techniques such as Fauxbourdon). Benedicamus Domino is a commission for the 47th International Organ Week Nuremberg 1998 as compulsory piece for the final round of the organ competition for the "Johann Pachelbel Prize".